Ahead of sitting today (Friday) January 29, Mr. Kanu had penned to the court asking that there should be a change in his representation. 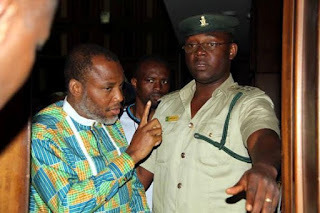 In the letter, read during a dramatic session, the presiding judge, John Tsoho said he was asked to change Mr. Kanu’s lead counsel, because according to Mr. Kanu, the person who represented him in previous sittings was different from the person he had instructed, 360nobs reports. The exchange resulted to a mild drama as Mr Udechukwu immediately stood down for Mr. Muoma to continue the case. Meanwhile,Members of the Indigenous people of Biafra (IPOB) across Europe, on Thursday, January 28 stormed Brussels, the capital of Belgium (the headquarters of the European Union parliament) venue for the European Union summit to protest the illegal detention of their leader and director of radio Biafra, Mazi Nnamdi Kanu, Naij.com reports. The Biafra Times reports that the members came from Germany, Russia, Italy, Spain, Austria, Ukraine, Ireland, England, Sweden, Kosovo, Switzerland, Finland, Greece, Hungary and other countries in Europe. The IPOB in Europe assembled in Brussels, Belgium in-front of the European Union headquarters where President Muhammadu Buhari is expected to address the parliament. The IPOB members are protesting the illegal detention of their leader, Mazi Kanu who they said has committed no offense. They are demanding the unconditional release of Kanu and freedom for Biafra as an independent state. Meanwhile, Kanu, has been in the confinement of the Department of State Security Service since October, 2015. The IPOB leader has been arraigned before both Abuja chief magistrate court and Federal High courts on charges of belonging to an unlawful society, managing and coordinating the society and of recent for treasonable felony against the President of Nigeria from 2014 to date. The IPOB protesters displaying Biafra flags. Kanu was granted bail by the Justice of the Abuja High court, but the DSS had since refused to obey court orders and release Kanu. He had remained in detention in defilement of court orders since December 17, 2015. Vidic won five Premier League titles and the 2007-08 Champions League in an eight-year spell at Old Trafford, but conceded injuries had forced him to call time on his career. The Serb was granted his release from Inter Milan earlier this month after an injury-plagued 18-month stint in Italy. “The time has come for me to hang up my boots,” Vidic said in a statement on United’s website. “The injuries I have had in the last few years have taken their toll. Vidic joined United from Spartak Moscow in January 2006 and formed a formidable centre-back partnership with Rio Ferdinand as United lifted three straight Premier League titles from 2007-09. He was also part of the United side that beat Chelsea 6-5 on penalties to claim their third European crown in Moscow, with the Red Devils again crowned English champions in 2010-11 and 2012-13. Vidic left Old Trafford to join Inter in July 2014, playing 28 times for the Serie A side, but after undergoing a hernia operation in August he failed to make a single appearance this season. The Government in a statement signed by the Commissioner for Special Duties and Intergovernmental Relations, Oluseye Oladejo, said preliminary investigation by his office and the State Fire Service Director, Rasak Fadipe, revealed that installation of substandard electrical appliances in most cases trigger fire outbreaks, adding that all hands to be on deck to forestall future occurrences. The government called on the Standard Organization of Nigeria SON to rise of to its responsibility to check the standard of materials coming into the state. The commissioner urged residents to be more vigilant and look out for only quality electrical appliances in the market as well as ensure that they patronise only qualified electricians to install same in their homes. He also urged Electricity Generation (Gencos) and Distribution Companies (Discos) to look into the power voltage made available to customers to prevent power surge resulting from high voltage which could cause fire outbreak. He said the state government will continue do everything within the confines of the law to ensure that lives and property of its citizenry are secured. The new tariffs approved for electricity consumers across the country will become effective on Monday and will enable the power distribution, generation and transmission companies to acquire needed infrastructure, the acting Chairman of the Nigerian Electricity Regulatory Commission, Dr. Anthony Akah, has said. Akah, who said this when he led top executives of the regulatory agency on a courtesy call on the National Orientation Agency in Abuja on Thursday, also said there was no going back on the new tariffs. 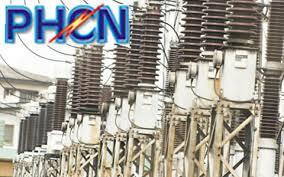 The NERC boss said the lack of cost-reflective tariffs had hindered the electricity companies from acquiring the necessary infrastructure, adding that with the new tariffs, they would not have any excuse for not delivering on agreements they entered into with the government. He said the Nigerian power sector reform must provide an appropriate pricing template, which had been lacking, leading to deficiency in revenues from power. This, he added, necessitated the new Multi-Year Tariff Order to enable the generating, transmission and distribution companies to provide the needed infrastructure for higher generation and supply of electricity to meet the needs of consumers. Akah said under the new MYTO, all premises must be metered and consumers who subscribe to specific metering models must be supplied meters within 60 days after which they would not be disconnected or charged on estimation if a meter was not supplied. 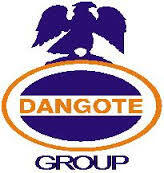 Dangote Cement P.L.C. 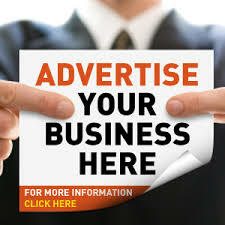 is the biggest quoted company in West Africa and the only Nigerian company listed among Forbes Global 2000 Companies. The Company currently has several cement production plants in Nigeria in addition to presence in 14 other African countries. To consolidate its current strategic expansion drive and as part of our growing vision. * READ ALSO: 6 Job Vacancies at Total Health Trust (HMO) Ltd.
6 Job vacancies At Total Health Trust (HMO) Ltd.
SaharaReporters has found that reports that the Eritrean government issued a decree requiring all men to marry two women, or face imprisonment, are false. This story was published by several African media organizations, including SaharaReporters, following two days of intense interest on news websites and social media. According to conversations SaharaReporters had with experts and Eritrean government representatives on Wednesday, the report is now understood to be a rumor originating on social media that later became extremely popular. The rumor later found its way to news websites in Nigeria and across Africa. On Wednesday morning, a SaharaReporters correspondent spoke with an Eritrean government representative attached to the Eritrean Mission at the United Nations in New York. The source flatly denied the rumor, and expressed frustration that hoax had gained the traction it had. Also speaking to a SaharaReporters correspondent on Wednesday morning, Eritrean expert Awet Weldemichael, an Assistant Professor at Queen's University in Canada, stated that he believed the reports were fictitious and “started as a joke” online. “I think it [such a decree] is in the realm of the improbable or impossible,” Mr. Weldemichael said. According to the false reports, the primary justification for the mandatory marriage was intended to fill the population gap in the country following the Eritrean war for independence in 1991 and the Eritrean-Ethiopian war between 1998 and 2000. Mr. Weldemichael, however, dismissed the notion that the Eritrean government would solve this supposed “population gap” with a decree forcing all Eritreans to engage in polygamy. In fact, the academic argued, the population of Eritrea has actually increased substantially since the war. The Eritrean government has not published an official statement addressing these rumors at the time of publication. 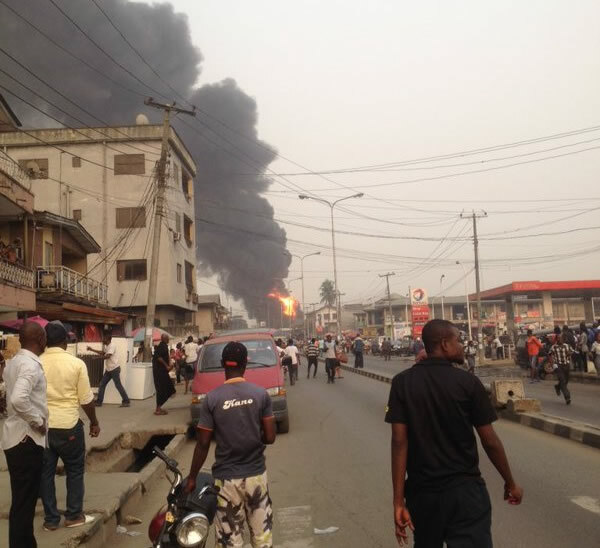 Reports reaching us claim, an Oando filling station in Lawanson, Surulere, Lagos is currently on fire. We therefore implore all relevant agencies to verify this and act swiftly. The British Deputy High Commission is looking to recruit an Intelligence Officer to work on a newly established joint unit ran by the National Crime Agency (NCA) but comprising of UK Border Force and Home Office Immigration and Enforcement (HOIE). This joint unit will be investigating and providing intelligence support into the investigation of Human Trafficking (HT), Drug Trafficking, Corruption and Economic Crime in Nigeria. The officer will work with local partners on all forms of Serious and Organised Crime (SOC) investigations providing and capturing current intelligence and ensuring all intelligence records are accurate. They will also conduct UK end intelligence enquiries to support Nigerian Operations. The successful candidate will undertake a variety of tasks including the analysing of ongoing and previous SOC operations to capture and record all available intelligence. To analyse and progress new opportunities to investigate SOC. The officer will be required to deal with suspects and possible passengers/potential victims of trafficking referred to the BDHC by airlines and partner agencies and to undertake checks against confidential databases. Receiving, handling and disseminating intelligence information. Operational support to NCA Managers. Identify opportunities to capture SOC intelligence. Analyse available intelligence in order to identify new SOC operations. Liaising with external partners and analysing information to identify trends. An understanding/awareness of UK law enforcement capabilities/investigative legislation. Work with programme leads and implementing partners to monitor progress against set criteria to deliver programme and component objectives. Be able to work quickly, accurately, flexibly (there may be times when unsocial hours of attendance will be required i.e. evening/weekends) often under time pressure. Have a positive approach to tackling problems. Willingness to take on new and challenging tasks. Good communication with excellent spoken and written English. The ability to remain customer focused, polite and courteous under pressure. The ability to work quickly and reliably with little supervision, to regularly meet challenging targets across the range of duties. The ability to effectively handle large volumes of information and identify trends. Excellent team players - this is an “all for one and one for all” environment. Internal applicants should also submit the above, with a copy of their most recent 24 months of appraisal evidence (i.e. two full appraisals, or however many abridged appraisals, minutes etc to make up two years’ worth of evidence) to the same email address. All candidates: Please quote in the subject line, of your email, the Vacancy Notice No: 03/16 LOS, and position you are applying for. Internal candidates, and spouses of diplomatic officers: Please quote in the subject line, of your email, the Vacancy Notice No: 03/16 LOS, and position you are applying for, and also indicate that you are an internal candidate, or spouse of a diplomatic officer. The British Deputy High Commission in Lagos is an equal opportunities employer, dedicated to inclusivity, a diverse workforce and valuing difference. 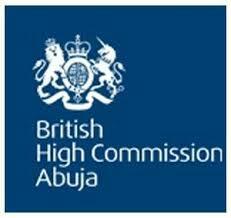 Staff members recruited locally by the British Deputy High Commission in Lagos are subject to Terms and Conditions of Service according to local Nigeria employment law. Due to the nature of the role it is necessary that any applicant be security cleared to confidential status, or demonstrate that they can easily obtain such clearance. Clearance is most easily obtained by UK nationals with at least 3 years residence in the past 10 years in the UK, USA, Australia, Canada or New Zealand. Nationals of the latter four countries may also be able to get clearance. Candidates must have a traceable history over the last 5 years. The main function of this post is to act as the Office Manager, providing administrative support to the National Crime Agency-led CSSF Joint Border Task Force (JBTF) project team, based in the British Deputy High Commission in Lagos. This is a multi-agency team consisting of officers from the NCA, UK Border Force, RALON and local engaged staff. Maintain and update accurate financial records in support of FCO and NCA budget management and procurement processes. Co-ordinate and deliver effective administrative support to the JBTF Project Team. This may include booking flights and accommodation and providing to logistical support to training events, workshops and conferences. Maintain accurate records in relation to incoming and outgoing intelligence reports including quality assurance to ensure compliance with NCA policies and operating procedures. Maintain and update CSSF Project Asset Register (including management of vehicle fleet). Timely completion of own performance records as well as that of those managed. Performing ad hoc duties identified as commensurate to the role. Excellent organisational skills and ability to prioritise workload effectively. All candidates: Please quote in the subject line, of your email, the Vacancy Notice No: 01/16 LOS and position you are applying for. Internal candidates, and spouses of diplomatic officers: Please quote in the subject line, of your email, the Vacancy Notice No: 01/16 LOS and position you are applying for, and also indicate that you are an internal candidate, or spouse of a diplomatic officer. The Supreme Court yesterday upheld the elections of four state governors: Nyesom Wike (Rivers), Ibrahim Dankwambo (Gombe), Ibikunle Amosun (Ogun) and David Umahi (Ebonyi). The Supreme Court also dismissed the verdicts of the Rivers State Governorship Election Petitions Tribunal sitting in Abuja and that of the Court of Appeal in Abuja which nullified the election of Wike and ordered for a rerun. In the lead judgement read by a Justice of Supreme Court (JSC), Justice Kudirat Kekere-Ekun, the apex court added that it would give reasons for its judgement on February 12. 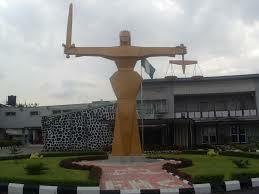 The first appeal was filed by Wike challenging the judgement of the tribunal and the Court of Appeal. The second appeal was filed by the PDP, while the third was filed by the Independent National Electoral Commission INEC, challenging the judgement of the tribunal and the court of appeal. The apex court allowed the three appeals and dismissed the objections raised by All Progressive Congress (APC) and its governorship candidate, Dakuku Peterside. Adopting his brief of argument earlier, lawyer to Wike, Mr Emmanuel Ukala (SAN), argued that Dakuku failed to present sufficient evidence before the court to prove that the election was marred by irregularities. Ukala said, “They relied on over voting in their argument but the registers they tendered before the court had only 11 local government out of 23 which was never demonstrated before the court. He urged the court to allow the appeal. On his part, lawyer to the PDP, Chief Wole Olanipekun (SAN), urged the court to dismiss the prayers of Dakuku on the grounds that he was not able to present sufficient exhibits before the court to show that people were kidnapped during the election in the state. According to Tribune, TWO suspected female suicide bombers hit Chibok Market in Chibok Local Government Area of Borno State leaving eight people dead and over 30 others in serious condition, a party chairman in Chibok, Lawan Pogu, told a relation in Maiduguri. According to reports from Chibok, on Wednesday, the Chibok market had been shut since the abduction of over 200 schoolgirls in Chibok by the Islamic militants. “The market was only opened today, and the suicide bombers hit the market at exactly 12:54p.m. Eight people died on the spot while over 30 were rushed to the General Hospital, Uba, in Askira Local Government Area with two of the victims in critical condition,” he said. Another resident of Chibok, Mallum Chibok, told the Nigerian Tribune that despite the presence of security in Chibok, the Boko Haram members succeeded in attacking the area. “I cannot understand the reason why government is insisting that normalcy has returned when you can not go to Chibok from Maiduguri through Damboa. 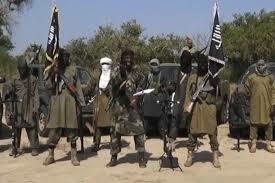 The road is still closed because Boko Haram members are still operating 21 kilometres away from Maiduguri. 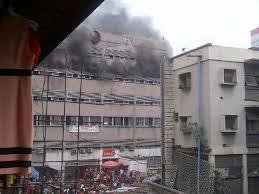 “Today, they opened the market and we lost eight people on the spot with over 30 hospitalised. From what we are being told, some of the people taken to the hospital gave up as soon as they reached the hospital in Uba. “From the text massage I just received, another six have died making the number 14. Since the attack, I have received more than 100 calls and more calls and text massages are coming in. This is very unfortunate. It is sad,” Chibok said. Meanwhile, the Boko Haram sect, on Monday, allegedly attacked a group of firewood traders in Jawu Village, about eight kilometres from Auno town, west of Maiduguri. Relations of the victims who spoke to newsmen in Maiduguri on Wednesday disclosed that seven people are still missing. According to Modu Mai Ali, a relation to one of the victims, the traders were on their way to purchase firewood from the forest for onward delivery to Maiduguri when the insurgents opened fire on them. Baba Furra, a hunter who was also one of those that escaped, disclosed that “we use to compliment our hunting expeditions with firewood trading. About 1:00p.m. on Monday, while we were moving toward Jawu Village to get firewood, we saw a vehicle coming towards our direction and we thought they were firewood dealers. Suddenly, they opened fire on us; about 15 of us, some pushing wheel-barrows while the rest were in the Isuzu vehicle,” he added. A youth vigilante, Musa Musa who was among those who conveyed some of the victims to the hospital said “eight of the traders escaped with one of them shot on his buttock and presently on admission at Umar Shehu Hospital. Seven others are missing. “But the news that the missing victims have been killed was a great shock and right now, we are joining forces with hunters and some security personnel toward the forest,” Musa said. A rescue official and a hospital official at Umaru Shehu Hospital, Bulumkuttu, who pleaded for anonymity, confirmed the admission of a victim with gunshot wound from Auno. As at the time of filing this report, both the military and the Police authorities could not confirm the incident but, independent sources and residents said such incidents are not new to most settlements around Jakana, Auno and parts of Damboa.